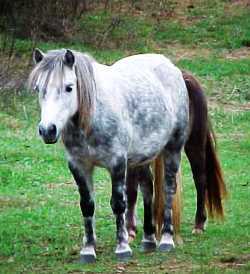 "Ceelie" is one of our senior herd mares. 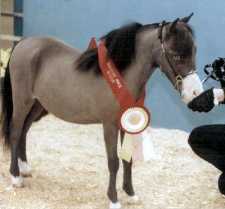 She has produced multiple halter winners, including a Reserve National Halter Champion Yearling mare. She passes her elegance on to her foals and is a strong color producer. 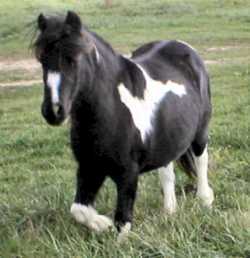 We will be breeding one of this mare's GRANDDAUGHTERS this year! "Fashion" is a mare that we were lucky enough to find several years ago. 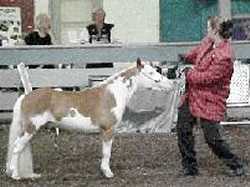 She has produced four incredibly loud overo foals for us. 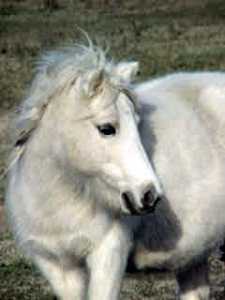 She is an every other year producing mare, which she more than makes up for by the size, color and quality of her foals! 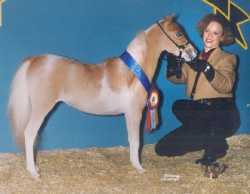 "Cheyenne" is a mare that has produced three National Halter Champions and several other National top Ten winners for her owners Lindsey Harrell & Dianne Jurhs of Broadway Miniatures. This mare has been boarded with us for most of her life and is one of the family. 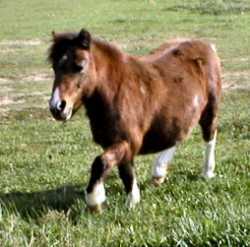 We have been honored to breed, raise and train all of her foals. 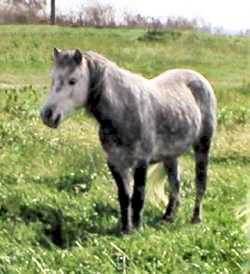 "Macy" is a silver Blue Roan mare. She has produced three very outstanding colts for us so far and was a multiple halter champion when she was shown through the age of two. She carries Rowdy bloodlines, which are reflected in her 2 black Rowdy-stamped colts. 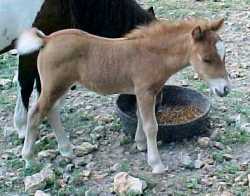 "Snip" ~ This little bay overo mare is like a stick of dynamite, BIG POWER in a small package. This unprepossessing and incredibly sweet little mare is the dam of AMHR multiple National Champion and Multiple Reserve National Grand Champion, Flying A's Heart's Afire, one of the most successful show mares in recent AMHR history. Snip just outdoes herself with EVERY foal. 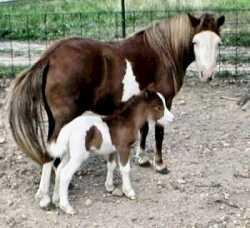 She had a beautiful Colt by Flying A Nimo's Court Jester in 2004. Flying A Magic's Twist & Shout "Tango"
This fabulous mare has grown up a bit since this photo was taken, in January of the year she ended up as the AMHR National Reserve Champion Yearling Mare. She has since become one of our best producing mares! Light palomino mare with a blaze. 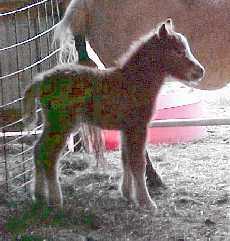 "MISSY" carries Wittmaacks and Master's palomino shetland bloodlines. 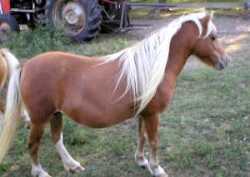 She had a NICE palomino filly in 2003. 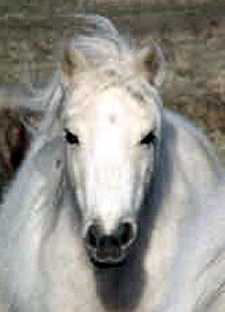 She had a lovely Sorrel ("Rio") filly with a wide blaze by Redrock Color Me Flashy in 2004. 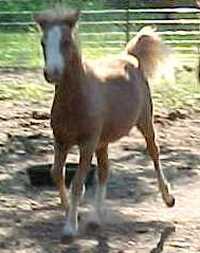 This year she has a STUNNING palomino filly.